TACLOBAN, Philippines — Filipinos are facing the powerful Typhoon Mangkhut with the memory of another devastating storm still fresh in their minds. 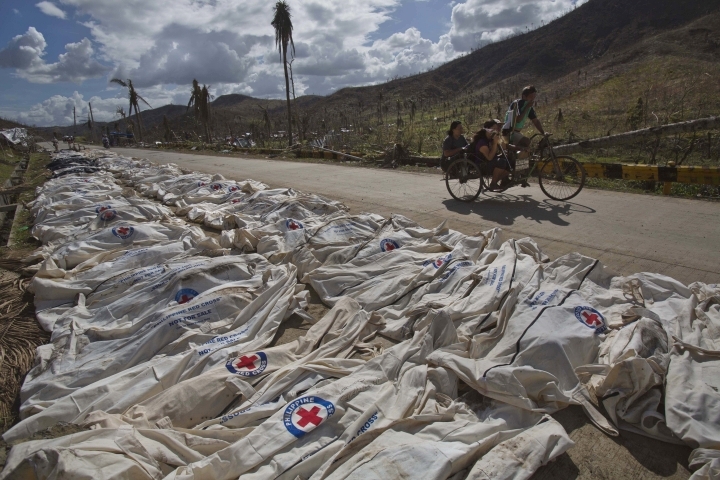 Nearly five years ago, Typhoon Haiyan left more than 7,300 people dead or missing, flattened entire villages, swept ships inland and displaced more than 5 million in the central Philippines — well to the south of Mangkhut's path. 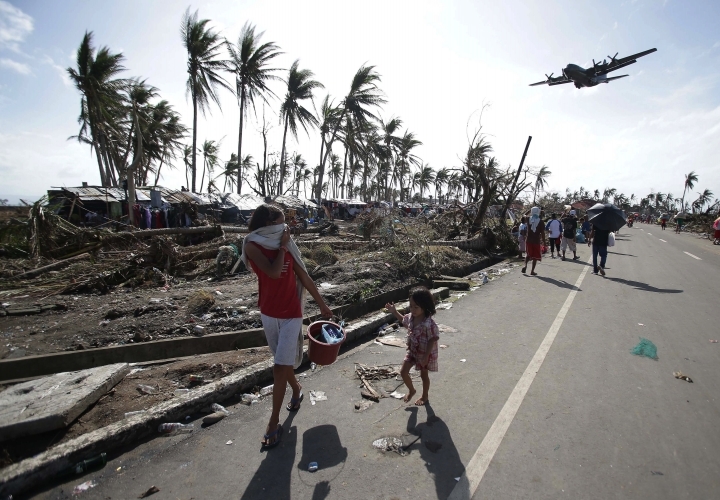 Haiyan demolished about a million houses and displaced more than 4 million people in one of the country's poorest regions. 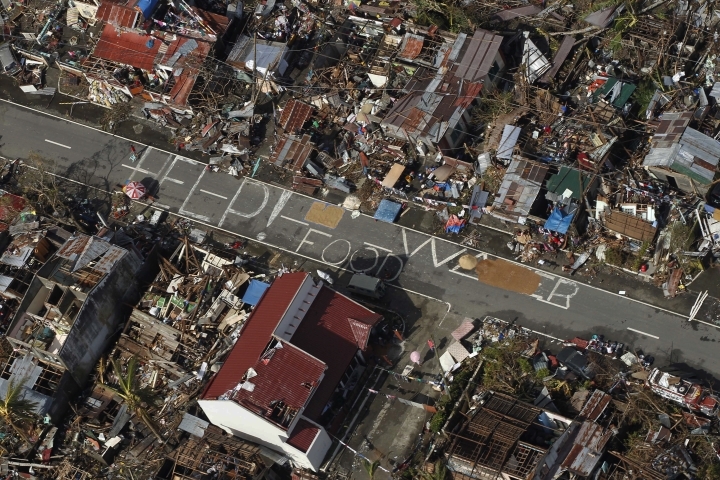 The Associated Press is republishing this Nov. 13, 2013, story written by Todd Pitman in Tacloban, the city hardest hit by the typhoon. 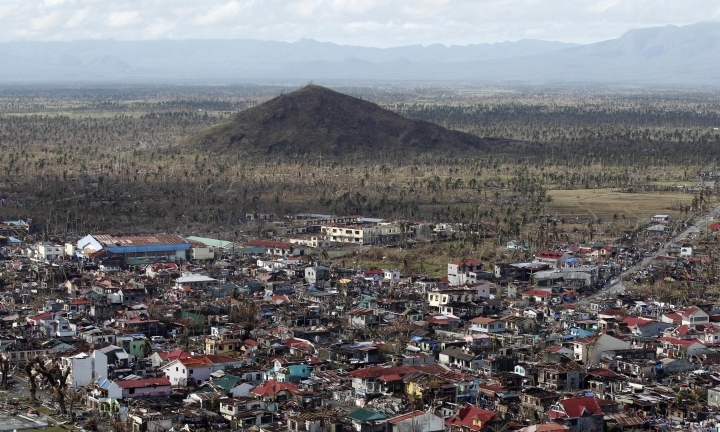 TACLOBAN, Philippines — Two days before the typhoon hit, officials rolled through this city with bullhorns, urging residents to get to higher ground or take refuge in evacuation centers. Warnings were broadcast on state television and radio. Residents steeled themselves for the high winds, floods and mudslides that routinely come with the typhoons that afflict this tropical nation. But virtually no one was prepared for Typhoon Haiyan's storm surge, a 6-meter-high (20-foot-high) wall of water headed straight for them. "It was supposed to be safe," said Linda Maie, who stayed in her one-room house more than half a kilometer (mile) inland. She had heard the warnings but said her Tacloban (tuk-LOH-ban) neighborhood "has never even flooded in my 61 years." Her family stocked up on canned food, water and candles and covered their TV, laptops and appliances in plastic bags. But when her 16-year-old daughter, Alexa Wung, awoke at 5 a.m. Friday to howling winds and heavy rain, it was clear that Haiyan was not a typical storm. The house was shaking. Its wooden door frame and window hinges were banging. Peeking through the windows, Alexa saw doors and screens flying and crashing. Their neighborhood was coming apart. Water began seeping in through the doorway as Alexa huddled in the tiny house with her mother and brother. Then it burst through like an explosion, ripping half the door off and quickly flooding the room with knee-high water. Within minutes, it was chest-high. By now, the family was on the dining table, watching in horror. Alexa's brother, Victor Vincent, glanced at the ceiling as the precious pocket of air grew smaller. They thought of escaping, but Linda couldn't swim. Alexa checked her cell phone. It was 8:30 a.m. The icon for her mobile service provider was replaced with a circle with a slash through it. "I knew then that even if we could scream for help, nobody in the world could hear us," Alexa said. "We were cut off from everything." And the water was still rising. It would be more than a day before the outside world knew what had happened. Haiyan was among the most powerful typhoons on record when it struck, with wind estimates at landfall as high as 315 kph (195 mph). But the first news reports hours later suggested that it had moved across the islands so fast that the country might have escaped a major catastrophe. The reality was that Tacloban and other hard-hit communities had been cut off, with electricity and cell phone towers knocked out. The worries, in Talcoban and around the world, had been on the wind much more than the water. That's why many of the 800,000 people who were evacuated found themselves in seemingly sturdy concrete buildings that could not protect them when the storm surge sea water pushed by the typhoon rushed in. "Everybody knew a big storm was coming," said Mark Burke, an American native of Washington state who lives in Tacloban with his three small children and worked as a civilian pilot on contracts supporting U.S. naval forces in the region. "But I had no idea it was going to be this hell. ... Nobody imagined what was about to happen." The water rose so high that some residents punched holes in their roofs with their bare hands to escape. Burke and his kids hid in a bedroom until a wall of mud came through the doors. The master bed was floating. "Then we all got on the piano, and it started floating through the hallway," he said. "The water kept rising, and we eventually climbed up into the attic and stayed there for a day and a half." In another part of Tacloban, Eflide Bacsal was standing in the kitchen of her family's home when the wall of water hit with a furious roar. "It was like a bomb BOOM!" said her 23-year-old sister, Gennette Bacsal. "It felt like an earthquake." The wave smashed through the windows and swept Eflide off her feet, sucking the 26-year-old under the swirling water. She frantically waved her arms, trying to find something to grasp. Her fingers closed around the power cord to the refrigerator. She held on as tight as she could and tried to pull herself to the surface, but the water only pushed her deeper. She couldn't breathe. Couldn't think. Couldn't see. In her panic, she began swallowing water. Everything went black. She felt herself dying. She surrendered. And then, a hand appeared her father's. He grabbed her shirt and yanked her to the surface. He hauled Eflide to the second floor of their home, where they waited along with Eflide's sisters and mother until the surge had passed. Other family members were less fortunate. Relatives including Eflide and Gennette's brother, 38-year-old Gonathan Bacsal, had taken refuge in a church, but they fled as water rushed in. As they ran through nearby woods, a cousin was decapitated by a piece of metal that whizzed through the air. Young and elderly relatives who could not swim were trapped by the rising water, but the family said Gonathan rescued many of them. He, too, was killed by debris: The storm blew several nails and a shard of metal into his neck. As Alexa and her family stood on their dining table, they contemplated their own deaths. The water was at Alexa's chest, and her mother's chin. "Where will we go? What can we hang on to?" Alexa cried. They were still amazed by the flood. No typhoon could cause this, Alexa thought. Then her mother was splashed by water on her lips. It was salty. It dawned on them: This was from the sea. Fish flittered across Alexa's back, and she recoiled in a panic. The family was at their very limit, and so, thankfully, was the storm. The water stopped rising, and began, very slowly, to recede. It was again knee-high by the time Alexa walked outside. Their neighborhood, of barber shops and restaurants and homes and streets filled with small buses known here as jeepneys, was gone. There was only a vast sea of debris: wooden beams filled with nails, shattered toilets and glass, concrete rubble, uprooted trees, twisted power transformers. Survivors wandered, dazed and wounded, covered in mud and grime. Many were barefoot with seeping gashes in their feet and bruises all over. Some covered their wounds with cloth, or diapers. 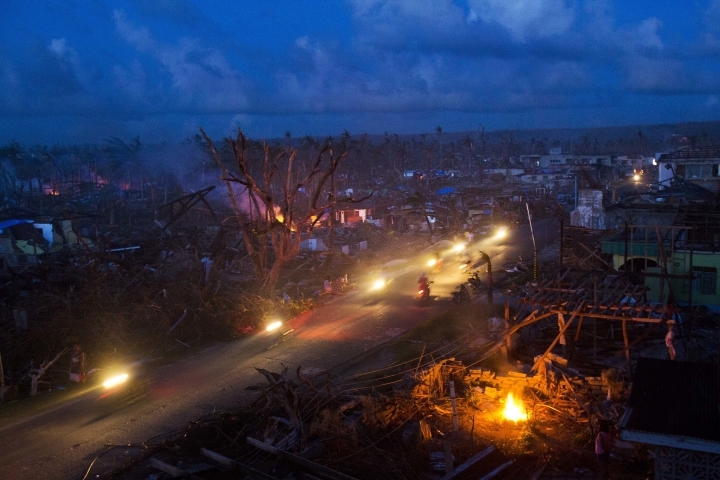 "Tacloban was unrecognizable," Alexa said. 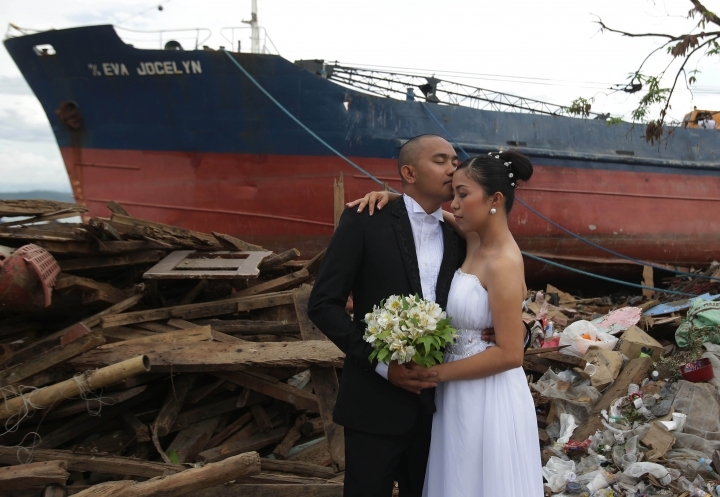 "It was as if Tacloban never existed at all." There was something else in the flatted landscape: corpses. And five days after Haiyan leveled Tacloban, many are still there. Scores of them lay at roadsides for authorities to retrieve, covered with whatever people could find corrugated iron rooftop slabs, wooden planks, cardboard, a broken desk drawer. Two bodies wrapped in white tarps lay on a bus-stop bench. Another sat on the ground below. People rolling luggage and carrying backpacks walked past, covering their mouths to protect against the sickly stench. One orange dump truck moved through the city to collect the remains. Emergency workers unloaded a dozen of them at building that once sold souvenirs. In all, there were more than 170 bodies in black bags, spread side by side. Bulldozers have cleared debris from most main streets, but the sidewalks are filled with everything imaginable: broken speakers, typewriters, cables, artificial Christmas trees. There have been no major food distributions. The city's main hospital has been gutted. Medicines are running out. Police can be seen chasing scavengers through the streets. International humanitarian organizations have yet to arrive. With no tents, people are sleeping in destroyed homes. One family took shelter in the shade of a giant uprooted tree, and cooked under a ripped gray rooftop held down with a broken basketball pole. And some people are even farther away from help. On Tuesday, military helicopters flew 15 minutes from Tacloban to the wasteland of a town called Tanawan, past a lake with bodies still floating in it and over bridges that had collapsed. Amid the ruins, desperate residents frantically waved their arms. Many had scrawled desperate messages in the ruins: "HELP! FOOD. WATER." Some messages appeared to be in chalk. One cry for help was spelled out in white clothing. Today, American and Filipino C-130 cargo aircraft roar constantly at the Tacloban airport. Each plane can only take out around 150 people, and every flight is a disappointment to hundreds of residents left behind on the tarmac. Gennette and Eflide have made it to Cebu. Burke and his kids flew to Manila. 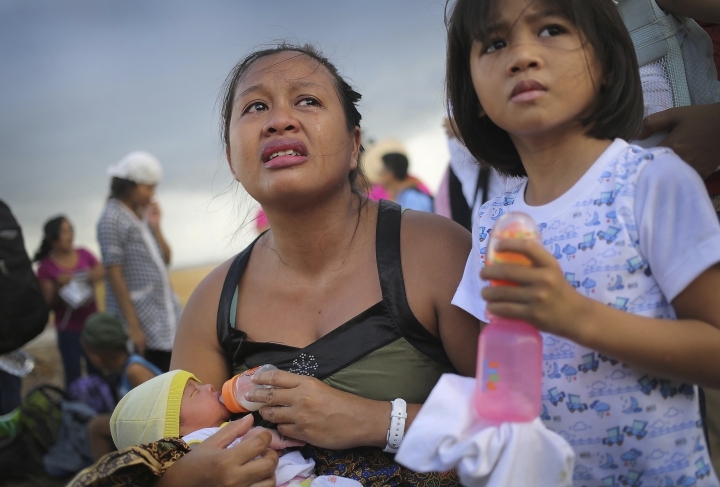 Alexa and her mother walked two hours to the ravaged airport terminal in hopes of leaving. Victor asked them to leave, so he could worry about guarding the house instead of feeding them. They were near the front of the flight line on Tuesday. But after a C-130 landed, the crowd surged to try to get to the plane. The crush of people was so intense that a 7-year-old girl passed out. Alexa and Linda could not endure it and stepped away. They sat on a curb, under an umbrella. Alexa was in tears. Their destroyed city lay behind them, an apocalyptic graveyard marked with disfigured trees and ruin. They said the government, and the world, had done nothing to help them. Their new plan: to leave Tacloban by bus and reach relatives in Manila. Alexa said she will return, eventually. "Filipinos have a saying: Weeds don't die easily," she said. "When it's safe, when there is electricity, when it's livable, I'll come back." 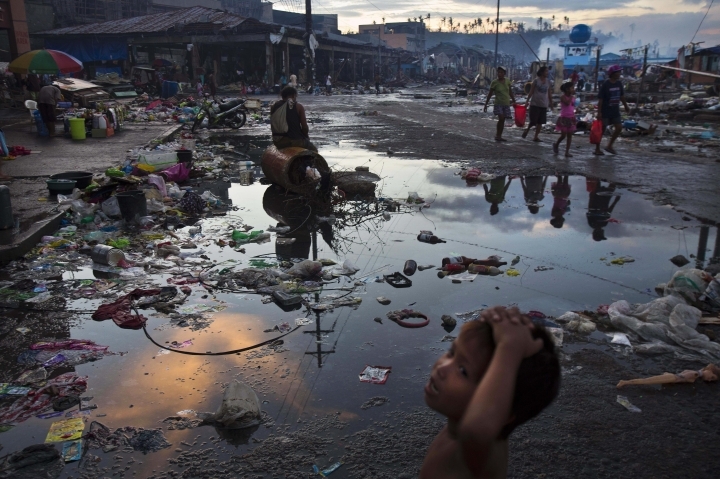 AP writers Jim Gomez and Kristen Gelineau in Tacloban contributed to this report.